Well, this looks like a real game-changer, not only in the short term but also in the "long run," so to speak. Yesterday we drove down to Durango for Jim's third appointment with Dr. Scott, the orthopedist he's been consulting while we're in Colorado. The doctor called us one evening earlier in the week to briefly describe the results of the MRI Jim had last week on his bum knee and recommended he come in for a series of visco-supplementation injections similar to what I get. 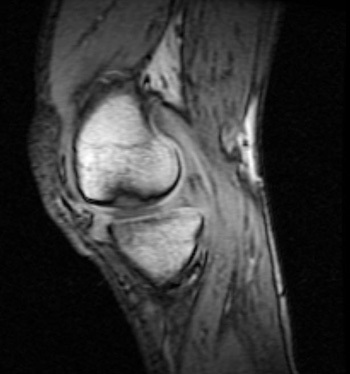 All we knew from the phone conversation was that Jim's meniscus probably hasn't torn again since his surgery last December (that's the good news) but he has a significant loss of cartilage on the inside of the knee (that's the bad news). Today we'd learn more details. Dr. Scott showed us the pertinent MRI images and gave us a copy of the radiology report. The MRI is more graphic -- and pessimistic -- than the X-ray that was initially done in Dr. Scott's office. Jim has a nickel-sized �divot� in the cartilage on the inside of his right knee ("severe medial compartment osteoarthritis with extensive full thickness chondral thinning involving the weight-bearing surfaces"). There is some cartilage on either side, but not right where the tibia and femur hit. This is also where he�s missing a section of the meniscus from surgery. 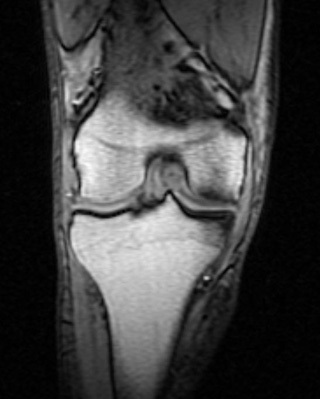 In addition, the ends of the two bones show obvious stress from impact ("associated subchondral bone edema and sclerosis"), there is degeneration in the back of the knee joint, and his MCL (medial cruciate ligament) is indeed torn -- Dr. Scott suspected that during his initial examination. Without the pre-surgery MRI for comparison it�s hard to know if this gap in the cartilage has formed since surgery or was already in progress due to aging/general wear and tear. The written report from the first MRI last November showed no degeneration and didn't mention any stress to the femur or tibia, so it's likely the cartilage has worn since Jim's surgery in December. We'll ask Dr. Johnson, our orthopedist in Roanoke, to compare the two sets of MRI pictures when we get back there in the fall. Jim got 2cc of Euflexxa, one of the six current brands of visco-supplementation that are used to cushion knees that are bone-on-bone or close to it. Euflexxa is all natural with no avian properties like the Orthovisc I get (and have great success with). Dr. Scott claims that Euflexxa is tolerated by more folks than the other brands but we don't know this for a fact; our orthopedist in Roanoke says Orthovisc is tolerated the best . . . The cynic in me will remain silent. Like my injections, Jim will get two more spaced six to seven days apart. 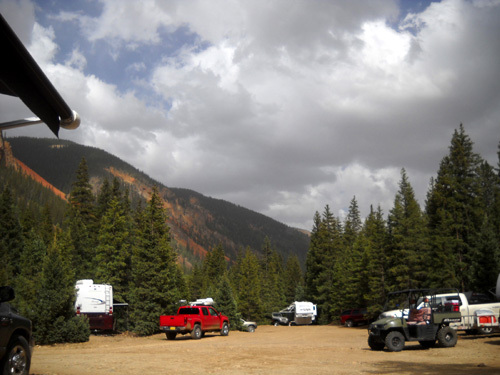 That works out just right for our tentative date to leave southwestern Colorado on July 11.
" . . . I very pointedly told him that, in my opinion, if he persists with this issue [issue???] of trail running and expansive distance running he will most certainly develop increasing degrees of pain and dysfunction and accelerate changes in the knee, which I estimate will likely result in the need for a total knee replacement sometime in the next two to four years, possibly sooner, but I doubt much later. I also then went on to restate the issue of his viscosupplementation [the Euflexxa injections], making it clear to him that this is not meant to rejuvenate his knee but rather, to treat and stabilize his pain, understanding that, unfortunately, there is no way to really gauge how successful this will be, but whatever success will come from this will be seen as a buying-time idea and not a primary treatment for his osteoarthritis, per se." During the visit we both heard Dr. Scott say Jim may need a total knee replacement as soon as one year if he continues to run. That's a very sobering assessment. Some new neighbors at our end of the campground (I'm standing next to our awning). Dr. Scott does total knee replacements (TKR) but we don�t think he�s encouraging surgery because of self-interest; he's trying to emphasize how important non-impact activities are so Jim can stay fit but delay the necessity of a TKR for as long as possible. I've heard the same thing from Dr. Johnson for two years because of my Granny Knees; my problem is caused by genetics and aging, not an injury like Jim had. Dr. Johnson basically said that the Orthovisc isn't to enable my addiction to running but to buy more time before I need both knees replaced. He didn't use those words but that's what I heard. That and no pounding! 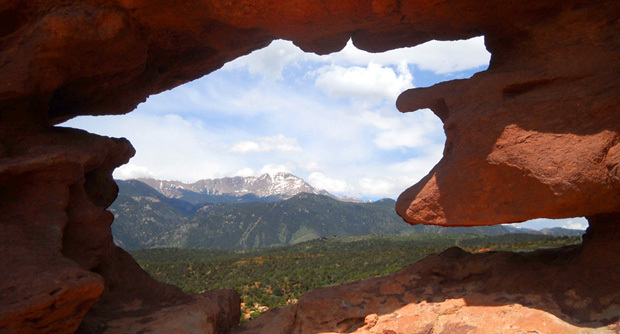 Anyway, Dr. Scott knows we don�t live in Colorado and aren't likely to become his TKR patients. Even so, his nurse, Corine, gave us a notebook full of detailed pre- and post-op information from Mercy Regional Medical Center about the procedure. We've both read through most of it already. Knowing more about the risks and rehab is pretty good incentive not to have a TKR anytime soon! However, if the injections don't alleviate Jim's pain in a couple of months he'll seriously consider getting the knee replaced in Roanoke this winter before it gets too painful. He wants to be in good physical condition going into surgery so recovery will be faster. We know several people who've had knee replacements and wish they'd gotten them sooner, not later. Some new neighbors are noisier than others . . .
how to time getting a knee replacement (before our knees hurt too bad and/or we�re out of shape and all other options). Jim also got a prescription for a medication to help him sleep better; it�s more pain relief than sleeping pill and is not habit-forming. Since he injured his knee the pain has been the worst at night when he's lying in bed. Ironically, it feels the best when he's cycling! That's how he injured it, not from running. We've been pleased with Dr. Scott and his staff. They have spent a lot of time with us and have made appointments quickly to meet our time constraints. Durango Orthopedics is also associated with the hospital next door (Mercy Regional Medical Center) where I received excellent emergency and follow-up treatment two years ago after my bike wreck in Silverton. WHAT THIS MEANS IN THE SHORT "RUN"
We have to re-evaluate our summer and fall travel plans, which primarily revolve around ultras! There is no way Jim can run the North Fork 50K or 50-miler in two weeks or the Grand Teton 50-miler on Labor Day weekend, let alone the Bear 100-miler at the end of September. 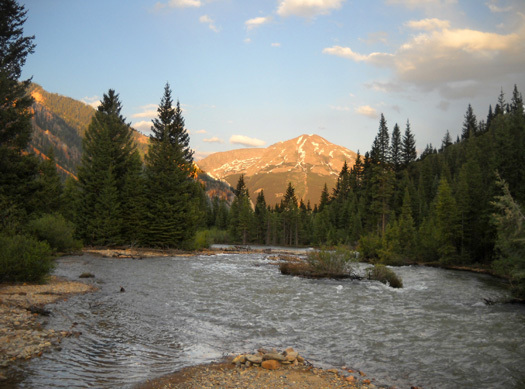 We still want to volunteer at North Fork on July 16 and camp inexpensively at Kenosha Pass, a National Forest Service CG, the week before the race. We�ll keep our plans for the USAF Academy July 18-August 1 and might be able to spend more time there (we have an additional eleven days we can camp there this year). 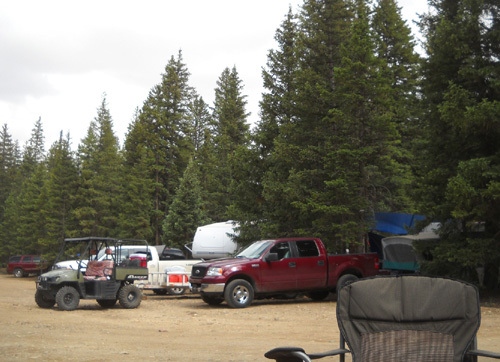 We will probably still go to Leadville for a couple weeks because it�s inexpensive, there is a good cycling path and trails to hike, we can get an internet connection where we stay, and we can see friends who are involved with the race as runners or volunteers. The group by the pit toilet has expanded . . .
We'll have to come up with some different plans for September and October. I'd like to keep our reservation at the Reunion Flat campground on the west side of the Tetons because the weather is good at the end of August/early September and I love the trails up into Teton Canyon. Jim can ride dirt and paved roads and bike trails in the area. We're considering new reservations on the east side of the mountain range in Grand Teton NP and perhaps Yellowstone NP after Labor Day, then possibly heading to southern Utah to visit some national parks and recreation areas. One Very Good Sign is that Jim is not only researching other places to visit, he's also looking online at mountain bike features and bike shops. I want him to get the best bike we can afford so he'll enjoy riding it. Then there are longer-term considerations we've been discussing recently, particularly what our lifestyle will look like with no running. If neither of us is able to run or even walk ultra races any more, we�ll be less inclined to work them. I stayed involved volunteering and crewing at races the last two years because of Jim�s continued involvement running them. He predicts it may be too hard for him to watch other people run, knowing he can�t run any more. We�ll have a chance to see how that goes while we're working the Hardrock race next weekend. If we enjoy it as much as we have previously, we'll be more likely to continue volunteering at other races where we feel valued by the runners and race management. This situation comes at an interesting time because for several months we've been planning an extended trip to Alaska next summer. Even if Jim was still able to run ultras then, we'd be missing all the usual late spring, summer, and early fall races we like to attend. The trip is so long and there is so much to see that we plan to spend from mid-May to mid-September in Canada and Alaska. We'd stay longer if winter didn't last so long up there! That trip might just be a good transition to us from a life revolving around running to one that doesn't. It's getting crowded by the creek. That's why we didn't want to park there when we came in last week. Sometimes I wonder if we�ll lose all of our ultra running friends now that neither of us can/should run any more. We share some other interests with the ones we know the best but running has been the dominant topic of discussion. Will they want to keep us in their loop if we can't relate our own training/racing trials and tribulations with them now? Will we be interested in hearing their running stories, knowing we can no longer participate in the sport we each loved so much for over 30 years? We�ll still see friends if we continue to work races but we may lose the incentive to do that as time wears on. We've seen it happen many times to folks who have to, or choose to, give up running. We hope the folks we like the best won't abandon us just because we can't run any more. If they think about it, someday they won't be able to run any more, either! Fortunately, some of our running friends also cross-train with cycling and hiking -- two activities we can still enjoy -- and we�ll make new cycling friends if we get more involved in that sport. Meanwhile, even when Jim and I can no longer run even a hundred yards we'll probably still consider ourselves to be runners. After two years of very little running I still sometimes say I'm "going for a run" when I'm going for a walk or hike. It just automatically comes out that way. Once a runner, always a runner. We've been enjoying a lot of sunshine and temperatures ranging from the 40s to the 80s since our arrival in the Silverton area. That ended with today's 70% chance of severe thunderstorms. I guess Colorado's monsoon season is finally upon us. The San Juans really needed the rain we got today. We could have done without the wind and hail, however. There was enough moisture to calm the dust but not enough to make much mud. I still think there should be a fire ban in San Juan County, not just signs prohibiting fireworks. The place is a tinderbox and some idiots in this campground don't have the sense to put fires completely out when they leave or go to bed.. I have visions of having to flee for our lives in the middle of the night because of a human-caused wildfire. La Plata County to the south does have a fire ban, which is smart. 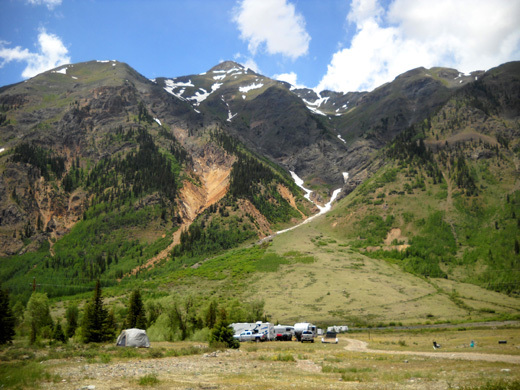 The mountains may still have snow and Mineral Creek is running high, but our campground is very dry. Speaking of wildfires . . . The Las Conchas fire near Los Alamos, NM has grown to over 80,000 acres. LANL, Bandelier, and the national forest/BLM lands are still closed. The city is still evacuated. We heard on the news that because of the nuclear materials at the Lab, this is the nation�s #1 fire-fighting priority right now. Besides nuclear-contaminated ground from WWII-era atomic bomb testing, there are about 30,000 55-gallon drums of Cold War-era plutonium-contaminated materials sitting around, waiting for disposal at a site in southern NM. What a mess. Other areas of New Mexico and other states -- including Colorado -- also have serious drought conditions and wildfires this summer, too. 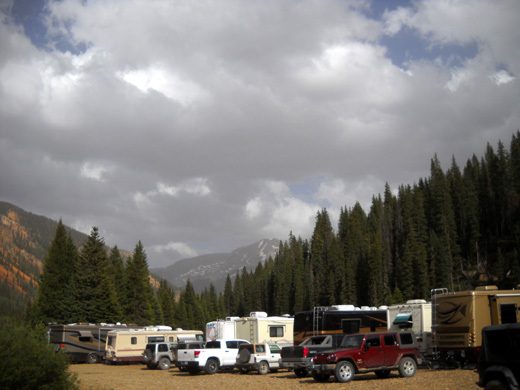 Our campground is getting pretty full now, with the weekend and the Fourth of July holiday coming up. It's always interesting to walk around in the evenings and see how the "neighborhood" changes as people come and go. More people are coming than going now, of course. This place will be totally packed in another day or two. Because of the high probability of rain today I decided not to hike on Colorado Trail Segment 25 from Molas Pass west toward Rolling Pass. 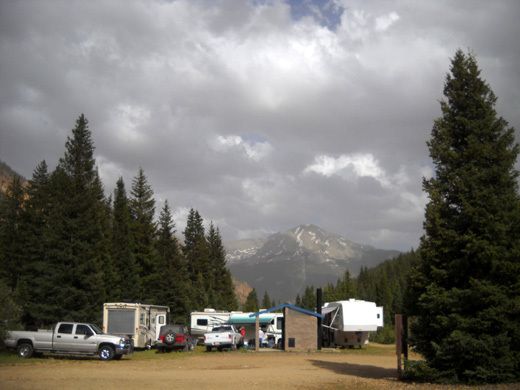 At 11,000-12,000 feet elevation it's too exposed to lightning. Tomorrow should be clear and safe for hiking.